This dynamic accessory will take your look to new heights. 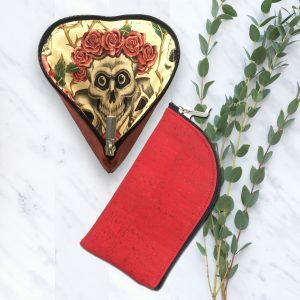 You will radiate timeless sophistication when this elegant clutch is in your hands at your next tea, cocktail party or lunch with old — and new — friends. This fully padded beauty features an envelope flap set off with chic metal trim and a turn lock closure. Remove or tuck the detachable chain wrist strap inside for a true clutch style. The inside is lined using the finest coordinating cotton fabric and features a zippered pocket. 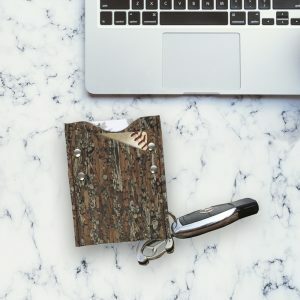 A natural, eco-friendly clutch, Studio Auckland’s Malbec Envelope Clutch is handsomely fashioned from the bark of the cork oak tree from Portugal. One need not be vegan to enjoy the loveliness of cork. Cork is soft to the touch, as well as stain, mold and mildew resistant and it’s PETA approved. Being a natural, handmade product, this item will show variations in color and no two will be exactly the same.